MEPHISTO substitutes for all symbols except the scattered special expanding symbol of the Feature games. 3 or more MEPHISTO symbols trigger 10 Feature games, and randomly reveal a SPECIAL EXPANDING SYMBOL that expands to cover all three positions on the respective reel and pays on any position. 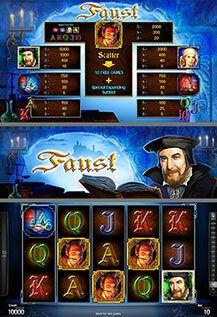 Feature games can be re-triggered during the Feature games and are played at current bet.